Before we pull back our hair and start torching anything, let’s all be envious of Margot for a moment, since she’s the lucky one who’s getting a signed copy of Thomas Keller’s Ad Hoc at Home. *envy envy envy* Okay, that’s enough. Margot, congrats to your random good luck! Everyone else, thank you for playing along; there is a very special video below that we made just for you. Margot, you’re not allowed to watch because you got the book. 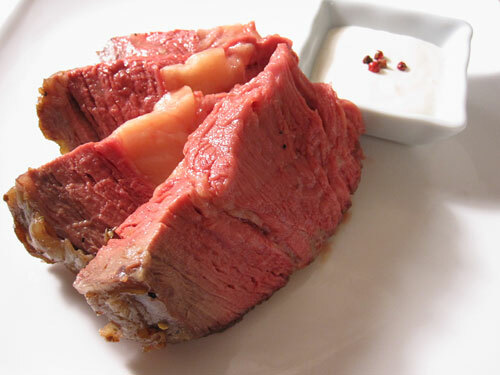 I promised a recipe that included a blow torch, so here is TKells’ Blowtorch Prime Rib Roast recipe from Ad Hoc at Home. Yes, we made it over the weekend. No, I don’t have a blowtorch, but I play one on my blog! Wait, no that doesn’t work. I cannot actually tell you how I got my fat little hands on an industrial-strength power welder propane-fueled blowtorch as TKells recommends in his recipe, as opposed to the weak “chef’s” torches that might as well be a butane lighter. The point is that I torched a giant round of meat, roasted it, and rubbed down my body with the crispy, curly, caramelized ruffles of fat that came out in the end. I actually did not do one of those three things. It’s up to your imagination to figure out which. Anyway, I am still reeling from an all-nighter that included big beef and excel spreadsheets (don’t ask), so I’m leaving you with a few shots from blowtorch beginning to end and a copy of Tkell’s actual recipe (reprinted with permission!) while I finish composing a proper review of my experience that I’ll add to this post later. If you make it to the very end of *this* post, you might find a little video that helped my sanity last night. You are 100% welcome to provide, encouraged to comment with, and in fact, I ain’t too proud to beg for, your feedback. After wielding the power that is a blowtorch, my ego could use a good reality check. 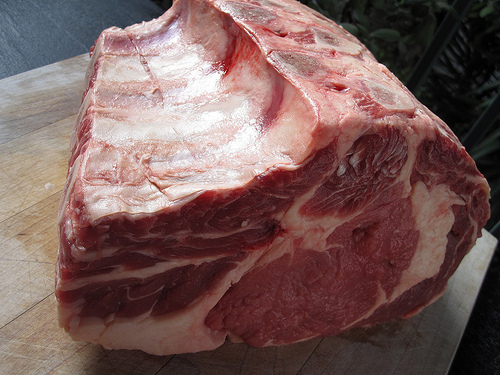 “I cook rib roast in a very low oven to ensure that it is a rosy medium-rare from the very center almost to its outer edges. But we like the dark caramelized surface, for flavor and for visual appeal, which is typically achieved through roasting at high heat. We discovered that if you start by giving meat a quick heating using a blowtorch, though it won’t look particularly brown after the toasting, it will develop a beautifully browned surface even in that very low oven. Propane torches are inexpensive and easy to use. Available at most hardware stores, they usually cost less than $20; replacement cylinders are usually less than $5. 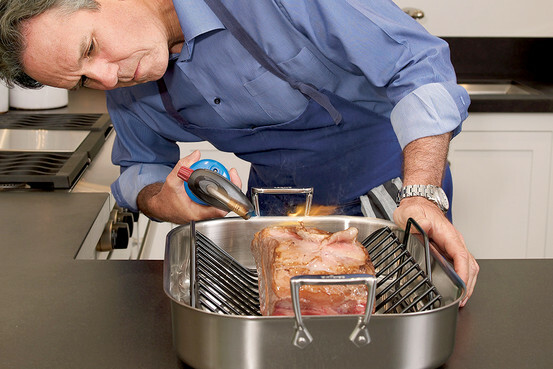 Avoid the smaller butane-fired torches sold at gourmet shops; propane torches are more effective. You can use a torch for caramelizing sugar on crème brûlee, browning meringue, and, as we do, giving a crust to your roast beef. “Be sure to store your torch in a safe place. Oh, that TKells. Always considering safety first. Transfer to the oven, with the meat toward the back of the oven, and cook until the roast registers 128°F in the center. The total cooking time will be about 2 hours, but begin to check the temperature after 1½ hours. 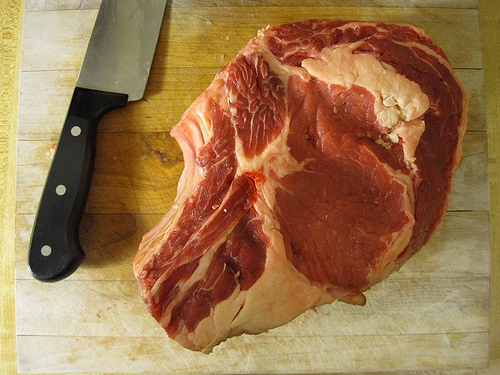 Remove from the oven and let rest in a warm spot for at least 30 minutes for medium-rare. 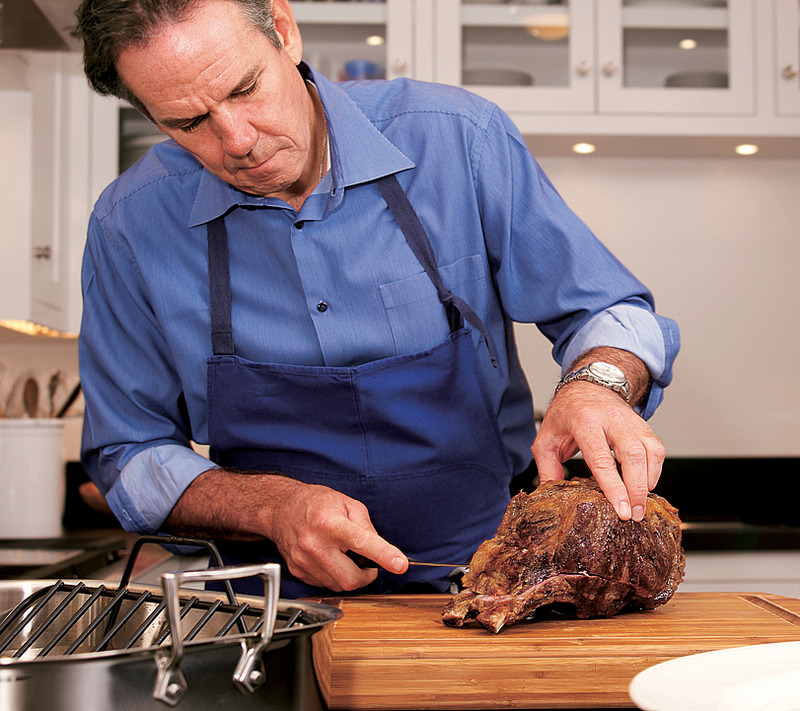 To carve, cut the meat away from the bones. Separate the bones and put them on a serving platter. Cut the roast in half through the center, turn each piece cut side down, and slice straight down into slices that are about ½ inch thick. 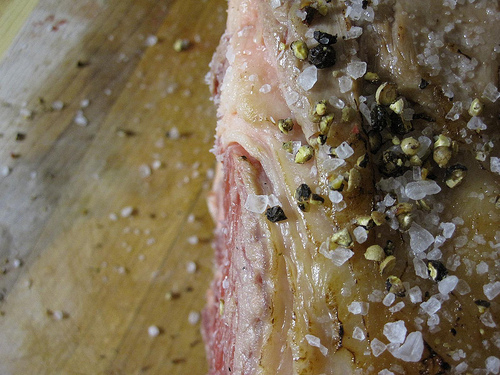 Arrange the meat on the platter and sprinkle with gray salt and pepper. This is a basic, and very easy, horseradish sauce—prepared horseradish and cream, seasoned with salt and pepper and a little bit of sherry vinegar. 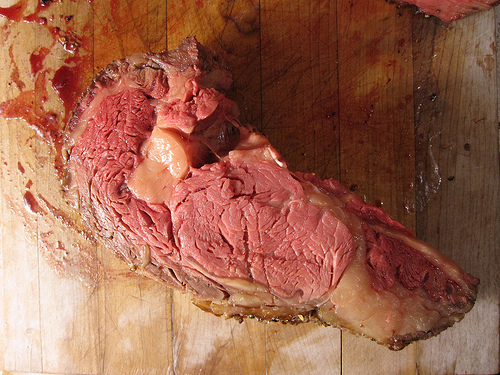 It goes especially well with grilled or roasted beef, like this prime rib roast, and the Peppercorn-Crusted Beef Tenderloin (page 47). Put the heavy cream and vinegar in a medium bowl and whisk until the cream holds a soft shape. Whisk in the horseradish, salt, and pepper.